If Bette Davis, Joan Crawford and Ida Lapino were still alive, these famous film stars would probably learn a thing or two about being pushy by watching Isabelle Huppert in Paul Verhoeven's new film with the small title of Elle. That's E-L-L-E. However, the personality of the person Huppert plays is anything but small, even though the actress is rather physically diminutive. Her character is called Michèle Leblanc. There's no doubt Michèle would give Donald J. Trump stiff competition in his never ending circus of shove and push back. Although Verhoeven is Dutch, Elle is done in French and a totally French creation, so it has class. It has a touch of Hitchcock, too; and almost as much creepiness as Alan J. Pakula allowed in his fabulous film called Klute --- the 70s thriller that starred Jane Fonda and Donald Sutherland. I hasten to add, however, unlike Klute, Elle has lots of laughs, in spite of repeating its opening scene in which Michèle is violently raped on the floor of her comfortable home by a man wearing a hood and clad in black. Another thing Michèle has in common with Donald Trump is that she's a businesswoman. Her product is video games. The one being constructed as the movie tells its tale is creepier than what happens to Michelle and other characters around her. It’s best that I leave what that is for you to see on your own. It’s possible that Verhoeven is pushing back with some of his own fun about so many successful video games being spawned by motion pictures. Other ingredients stirred into this recent Golden Globe winner of Best Foreign Film includes a horrific past for Michèle and her infamous father, who has long been in prison for notorious crimes he committed when Michèle was a child. Then there's Michèle's still promiscuous, elderly mother who pays for young men to visit her from time to time. I did mention Elle is a French film, didn't I? But what about the bad guy who has raped Michèle? Several men at her office who help her create creepy video games seem suspect. Even one of the men who have known Michèle more intimately might be playing a vicious hide and seek sexual game with her. We don't know. And that makes this Verhoeven movie a whodunit not terribly, as I say, unlike what a guy named Alfred used to do quite well, thank you very much. Michèle has a longstanding woman friend named Anna. One scene suggests that Michèle and Anna had previously attempted to find whether they could generate a sexual tension between them. Seems that: maybe not. But the actress who plays Anna needs some description. Her name is Anne Consigny. I remember her quite well as a main cast member in one of my favorite European imports that showed a few seasons ago on cable television. It was the very creepy and really well made production called Les Revenants or The Returned. If you've not seen the series, you're now getting a thumbs up that you should check it out. Verhoeven has done a masterful job mixing several kinds cinematic concepts. He keeps the movie from presenting itself as a mishmash of genres. But the film ran a bit long for me; and looking back, I can remember spots in it that might have been best excised. British musician, Ann Dudley composed, orchestrated and conducted the score. Other film scores by Ms. Dudley include The Crying Game, Bright Young Things, American History X, Pushing Tin and The Full Monty. 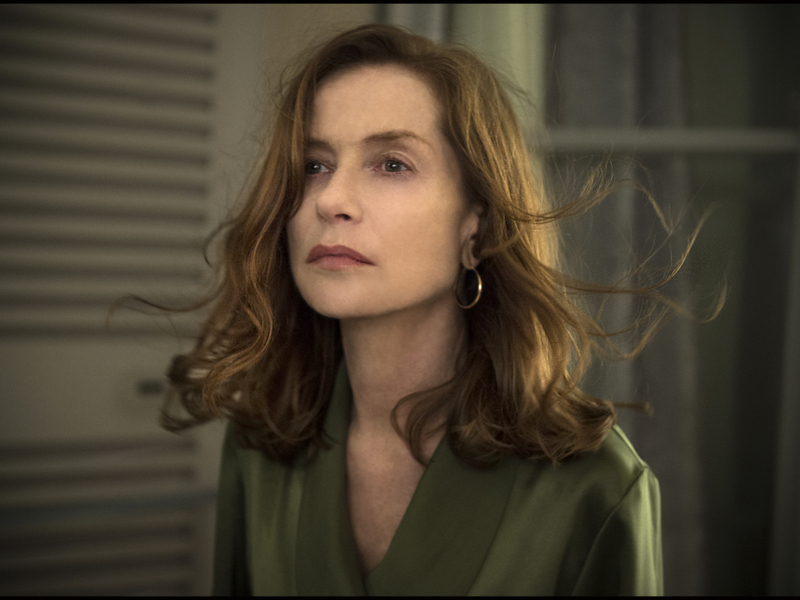 Isabelle Huppert, if you didn't notice the other night on the Golden Globes award show, also won Best Actress for her performance as the confident, efficient, naughty and indefatigable Michèle. Some belle she is.